Animal Hospital Ensemble circled the audience at the Pozen Center show. The surround sound you hear at a concert is ultimately technological trickery - the woofers in the back of a venue, the speakers hanging from the rafters. Sunday’s performance by Animal Hospital Ensemble at the Massachusetts College of Art, meanwhile, was authentically immersive. 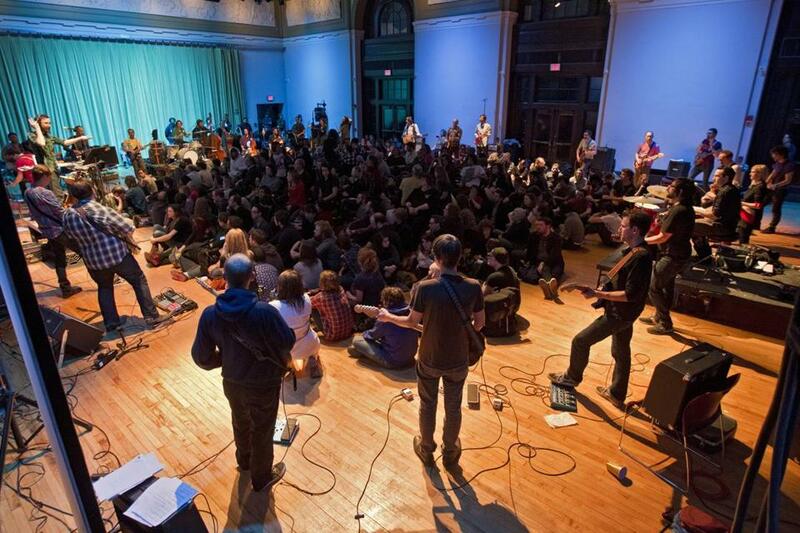 The crowd of over 200 filed into the Pozen Center, grabbed seats in the middle, and soon found themselves engulfed in a circle of two drummers, six string players, and 22 guitarists, featuring artists from local outfits such as Hallelujah the Hills and Beautiful Weekend (the night’s opener). “If nothing else, this is going to be interesting,’’ said Kevin Micka, the concert’s ringleader and the one-man army behind the ambient-electronica act Animal Hospital. The songs were plucked from his 2009 album, “Memory,’’ which he composed, produced, and, until Sunday, had performed exclusively by himself using loops. Songs frequently began with dramatic swoops of double bass and cello, before various permutations of guitars delicately entered, eventually unfolding into thunderous walls of distortion and feedback. Micka’s ethereal wordless vocals occasionally hovered hazily atop the mix. On “. . . and ever,’’ the orchestra of guitars stabbed, swirled, splintered, hummed, murmured, and moaned. Some sounded like brass, or synths, or even voices. The glacial chord changes and sumptuous white noise established a sense of silence and space, and at several transcendent moments, the band of 30 seemed to move as one living, breathing organism. The logistics weren’t perfect - organizers divvied out a couple dozen chairs that resulted in many an obstructed view - but the overall experience was engrossing. U2’s recent “360° Tour’’ put the stage at the center of the audience: Sunday’s slightly smaller-scale show demonstrated that the opposite configuration is what delivers true immersion. Adam Conner-Simons can be reached at adam.connersimons@yahoo.com.